This week has been crazy for me as my stomach has felt upset every evening. Maybe I ate too much of beef that over supply the demand of meat of my body. Thus, I think of some salad that helps me balance the crazy stomach. 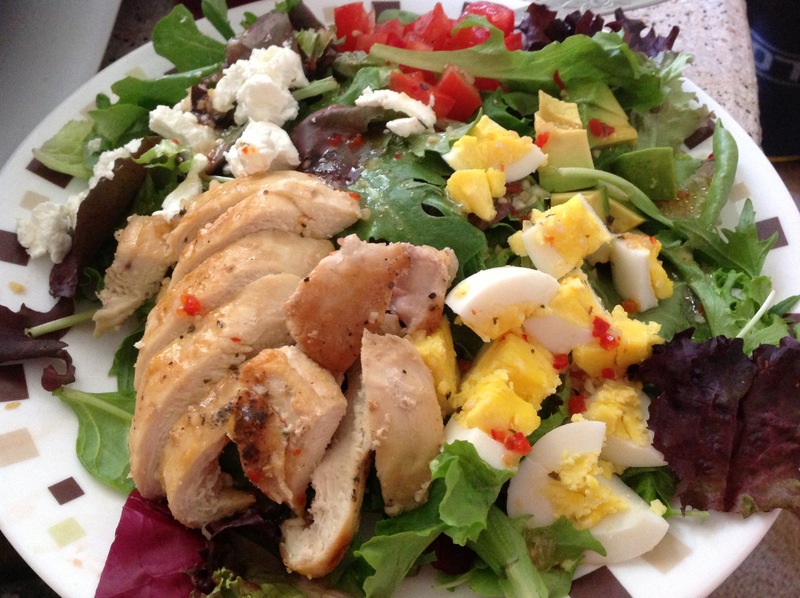 Cobb salad is an American salad that usually consists of Romaine lettuce, bacon, hard boiled egg, avocado, tomato, roasted chicken breast, blue cheese and red wine dressing. This salad takes you only 15 minutes to prepare, including boiling the egg and frying the bacon. In my version, I skip the bacon because I have eaten too much meat for this week and the dressing here is not 100 percent handmade. I mix a store-bought sweet Dressing and red wine. This is the fastest way for someone that does not have enough ingredients like garlic, herbs but still wants to enjoy this salad. In addition, I used assorted vegetables instead of only Romaine lettuce to satisfy my need for vegetables for this week. – blue cheese, crumbled as much as you like. I use only 1 tbsp for each person. – combine red wine with dressing then drizzle into the salad 5 minutes before serving. This entry was posted in American, vegetables and tagged american, salad, vegetable. Bookmark the permalink.